INDIANAPOLIS (October 5, 2007) – Governor Mitch Daniels announced today that the ISTEP test will move back to the spring. The governor said the State Board of Education informed him it has concluded negotiations for a spring test and expects to soon enter into agreement with CTB-McGraw Hill and Questar Assessment, Inc. to provide the new assessment at a lower cost than now paid annually. The cost of the test was $31 million annually. It will drop to $29.5 million each year for two years, then to $28.5 million in the third and fourth years. Spring testing will begin in the 2008-09 academic year. Students will take the current ISTEP for the last time in September 2008 to be tested on what they learned in the 2007-08 school year, then take the new test in spring 2009 on what they’ve learned in the current academic year (see attached schedule). Thereafter, the test will be given only in the spring. As a result of 2006 legislation, the State Board of Education was assigned to develop a comprehensive state assessment system. After much public input, the board unanimously approved a new comprehensive testing plan for K-12 students and schools in November 2006, which includes diagnostic testing in the fall and throughout the year and accountability testing in the spring for grades 3-8 and high school end of course exams. The board issued a Request for Proposal early this year for the new assessment system. This marks the first step from a standalone test toward a true assessment system that measures student progress throughout the school year. We are hopeful that our testing vendors will deliver on the promises outlined in their proposals, and the associated cost-savings can be reinvested in on-demand classroom assessments that help guide instruction and student learning throughout the year. As I have long said, this is not merely a choice between fall or spring testing, but rather an opportunity to provide our schools with more resources that support increased academic achievement for all Indiana students. 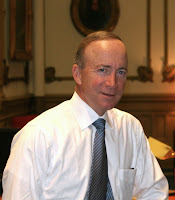 INDIANAPOLIS (September 5, 2007) - Governor Mitch Daniels took action today that will help more homeowners get property tax relief in 2008. The governor directed counties to accept homestead deduction and credit applications from now to October 15 for those who previously missed the filing deadline this year. The standard homestead deduction reduces the taxable value of a home occupied by its owner by as much as $45,000 in 2008 while the homestead credit reduces the amount of taxes owed. The application for the homestead deduction and credit are filed with the county auditor. "As I travel, I am meeting citizens who overlooked this deadline and are now facing the double whammy of a property tax increase without the protection of the homestead deduction and credit they are entitled to," said Daniels. "I've received bipartisan assurances from the legislative leadership that this extension will be ratified when they convene in November." To be eligible for a homestead deduction in 2008, persons must be the owner of their primary residence as of March 1, 2007. The deadline to file for a homestead deduction and credit in 2007 was June 10. Those who filed by then need not do so again. Legislation approved and signed by the governor provides for an additional $300 million in state provided property tax relief this year and $250 million more in 2008. Those who missed the June 10 filing deadline but meet the October 15 deadline will now be eligible for this 2008 property tax relief they otherwise would have missed. The governor's action requires ratification by the Indiana General Assembly. Legislative leaders already have concurred with the governor's action. This is the latest in a series of actions Daniels has taken to address the state's property tax problems. Most recently, on August 24, the governor extended the deadline for counties to adopt a local option income tax to December 31 and directed that the Department of Local Government Finance issue a memo to remind assessors throughout the state that it is not necessary for homeowners to provide an appraisal to appeal a property assessment. (September 24, 2007) - Governor Mitch Daniels and Congressman Pete Visclosky today sent a joint letter to the Northwest Indiana Regional Development Authority (RDA) to request assistance with funding to complete the Little Calumet River Flood Control and Recreation project. Daniels and Visclosky have asked the RDA's Board to provide $6 million in local match funds needed to complete the work. They have suggested that the RDA consider an advance to be repaid over the next several years in state appropriations that are contained in the state's budget. Since 1990, $119.2 million in federal funds have been obtained to support the levee construction, and there is $15 million in Fiscal Year 2008 Appropriations to support construction activities. "When complete, the Little Calumet River Flood Control project will get people, homes and businesses out of the floodplain and eliminate their mandatory flood insurance payments - which is essentially an automatic tax cut for the people affected in Northwest Indiana," said Congressman Visclosky. "I applaud Governor Daniels for thinking outside the box and collaborating on a creative solution to finish this important economic development project." "Congressman Visclosky and I discussed the project while I was in Washington last week and quickly agreed that we would approach the RDA to seek the assistance needed to complete this project that will benefit so many people in Northwest Indiana," said Governor Daniels. INDIANAPOLIS (September 14, 2007) - Governor Mitch Daniels today announced the appointment of Teresa Voors as commissioner of the Indiana Department of Workforce Development (DWD). She will replace Andrew Penca who is resigning to return to the private sector. "We're grateful Andrew interrupted a successful career to give three years to help develop Indiana's workforce for today's global economy," said Daniels. "Teresa's service since day one of this administration at DWD makes her a natural choice to assume this role as we continue our economic comeback." Voors, of Zionsville, currently serves as the agency's deputy commissioner of strategic planning and policy as well as DWD's chief counsel. Prior to joining the Daniels' administration in 2005, she practiced labor and employment law at Baker & Daniels. Voors received her undergraduate degree from Indiana University-Purdue University Fort Wayne and her law degree from Indiana University-Bloomington. Martin "Marty" Morrow, currently DWD deputy commissioner and chief information officer, will assume the role of chief operating officer for the agency. He previously worked for Eli Lilly and Company and founded several software companies. He received his undergraduate degree from Iowa State University and his masters in business administration from Purdue University. DWD manages and executes employment programs and unemployment insurance systems for Hoosiers and facilitates regional economic growth initiatives for Indiana. Voors' appointment will be effective September 21.